Channeling is a process whereby an individual (the ”channeler”) claims to have been invaded by a spirit entity, which speaks through the channeler. It is claimed to be the ability to make contact with divine creatures and levels of consciousness, which is thought to possess informations of spiritual value for people, and through the body mediate communication from these levels. The phenomenon plays a great role within the New Age environment. Channeling is grown out of the 19th century spiritualistic and occult environments, where special so-called ”mediums” received messages from for instance dead relatives and passed on these to a circle of people at special ”séances”. In this early ”channeling” the ability to be ”medium” were perceived as exclusive and something, which not all were able to. The modern channeling-phenomenon, where you no longer speak of ”medium”, but of ”the channel” (that is to say: the one who channels), has roots in Theosophy, and its conceptions of The Great White Brotherhood, a hierarchy of spiritual masters (see my article The fascism of Theosophy). Helena Petrovna Blavatsky, who is one of the founders of Theosophical Society, became in New York in 1873 precisely involved in the American spiritualist movement, where she established herself as medium and started to give séances. After the foundation of Theosophical Society in 1875 she started her first book, ”Isis Unveiled”, which was published in 1877. The year after she and Harry Steel Olcott moved to India, where Blavatsky started to receive ”messages” from so-called Mahatmas, spiritual masters. After that Richard Hodgson, in his 1885 report to the Society for Psychical Research (SPR), concluded that Blavatsky was a fraud, and didn´t receive the claimed messages, but invented them herself, she moved to London, where she tried to recover after the scandal. The report has later been questioned though. In London Blavatsky began her life as an author. Influenced by the works of Madame Blavatsky, another theosophist, Alice Bailey, described the majority of her own works as having been telepathically dictated to her by a “master of the Wisdom”, initially referred to only as “the Tibetan”, or by the initials “D.K.”, later identified as Djwal Khul. The theosophical influenced UFO religions are an expression of the modern making use of channeling with for instance messages from space gods and galactic masters. Within the New Age environment channeling today plays a still greater role as one of the many rituals, and, contrary to the early spiritualistic forerunners, channeling is considered as an indwelling ability which all people can learn if they open their spiritual consciousness. In this way there is held courses and educations in channeling. It is therefore the same Consumer Capitalistic spirituality, where you can buy yourself to spiritual authority, which also is seen in all kinds of other connections within the New Age environment (see my articles Six common traits of New Age that distort spirituality, and Management theory and the self-help industry). There are in that way many non-enlightened New Age teachers today – (they might very well have strange paranormal abilities, it doesn´t matter in this question) – who get authority by claiming, that their teaching, either is coming from a state of enlightenment, is being channeled from some kind of divine source, or are coming from clairvoyant abilities. If such teachers put their teaching forward in this way, you can be hundred procent sure, that this teacher has a problem with ego-inflation - if he is not directly a fraud -and them there are thousands of within New Age (see my articles The ego-inflation in the New Age and self-help environment, and Spiritual crises as the cause of paranormal phenomena) Why? Because no real enlightened master, or sober spiritual teacher, would argue in this way. True enlightened masters, or sober spiritual teachers, speak from their own source, and are always characterized by humility. Just look at Dalai Lama, who incessantly claims, that he hasn´t reached the full Rigpa, and that he is just a beginner. True enlightened masters, as well as sober spiritual teachers, are also always philosophers, who are giving reasons and presenting arguments to support conclusions. 4) Who are the non-physical entities channelers claim to be channeling? As already mentioned: Truth by Authority is about taking statements to be true simply because an alleged authority (experts, teachers, states of enlightenment, divine sources, paranormal abilities, etc.) on the matter has said/justified that they are true. A level of critical thinking is always appropriate, because the statement may be based on magical thinking, false premises, faulty reasoning, wishful thinking or vested interests. People, who in their arguments/teachings, again and again, have to defer to some authority (experts, teachers, states of enlightenment, divine sources, paranormal abilities) in order to justify their arguments/teachings, are hundred procent on the wrong track, even if they should have some paranormal abilities. It is interesting to see that true enlightened masters, as well as sober spiritual teachers, never do this. And interesting, that probably most of the many people, who have made a business of being clairvoyant/mediums/channelers etc., will fall for Truth by Authority. Nobody can, spiritual seen, tell you about your karmacially structures, or your spiritual evolution. All people, models or techniques - clairvoyants, channelers, regression therapists, shamans, Theosophy, Astrologers, prophets etc. etc. - who are claiming they can help you karmacial – that is: with your spiritual growth - are cognitional and ethical delusional and deceptive. The genuine karmacially structures do not lie in the collective time, but in the universal time which work in synchronism with the Now. If the karma idea is used spiritual seen correctly, then the focus, instead of being projected out in something afar (past lifes, a guru, birth, the future, Theosophy), will be present in something very near, namely only in the most intensive experiences of this actual life, and after that: in this actual Now with its possibility of realizing your innermost (read more about karma in my article What is karma?). So the universal images are lying as a kind of dream-tracks and song-lines in your actual life here and now. Only here and now they can be discovered. Only Man himself can find the progressive karma (explanation follows). The consciousness has the key in its life. It helps nothing, what people through a system may be able to think about the collective time, or fantasize about karmacially experiences and spiritual evolution. Many of these experiences (for example about past lifes, the past and future events/necessary actions) – and which have a certain reality for either the clairvoyant or the channeler – are collective fantasies (more about this below). Also A Course in Miracles should be mentioned. A Course in Miracles is the name of a book, allegedly dictated by Jesus to Helen Schucman (1909-1981), a research psychologist. The book explains what Jesus really had in mind when he came to save the world. The popularity of Schucman´s book gives testament to the attractiveness of New Thought´s revisionist biography of Jesus as wanting more love and forgiveness (positivity), and less suffering and sacrifice (negativity). In looking at the suffering in the world the Course says that this world cannot be created by a God. Heaven awaits us all and there is no hell; that is: the prompting to deny and ignore suffering and negativity. So, the Christian terminology employed in the book is thoroughly redefined to resemble New Thought teachings. Thereby it also contains all the problems of the positive psychology of New Thought; that is: it fails to understand the meaning of suffering (see my articles The New Thought movement and the law of attraction and Suffering as an entrance into the source). First of all: no unenlightened person can directly channel an enlightened consciousness/being. This would mean that either the channeler was enlightened - and therefore not in need of channeling anything - or that the channeler was very close to enlightenment and therefore experienced genuine mystical experiences. In both cases non of the 4 problems would occur. In order to explain who the non-physical entities are - which channelers claim to channel - I will try to characterize a particular area of the polar relationship of some collective energy-processes, where informations from the Source (the divine energy-source, the otherness – God, whatever you might call it), through individual persons, are transformed via the mandala-structures of the universal images, down through the polarized structures of the collective images, to the personal images. However you are, in this astral state, still on the plane of the collective images of time which work in sequences in past and future, and you are in danger ending up in a spiritual crisis. A spiritual crisis is an expression of, that you have gone out in the collective time with your Ego, without having done the philosophical preliminary work; that is to say: the realization-work and the ethical training. The Ego will then make you loose your way in the collective time. This can happen in two ways: either as suffering (often called The Dark Night of The Soul), or as Ego-inflation. Around ethical highly placed spiritual teachers (both physical and non-physical) there seem to be formed existential mandala-structures, which, as great energy-whirls, canalize highly growth-advancing energy and consciousness-waves from the Source (the Now, life itself). These mandala-structures necessarily have to arrange themselves after the collective images´ polarization-patterns in past and future, whereby the lines are formed which the energy and the transmissions can follow into the personal images, which after all also only work in past and future. When an individual person has a realized access to the collective time´s area of energy, we have to do with a spiritual teacher of one or the other kind. The realized transmission of energy and consciousness will always be characterised by a spiritual teacher who not only has realized the collective time´s astral worlds, but in addition to this also the universal time, and therefore truth and reality (which means that he or she is an enlightened master). This teacher is therefore able to discriminate between the image and the reality, and therefore able to relate relatively to the relative and absolutely to the absolute (what critical thinking is all about – see my book A Dictionary of Thought Distortions). The collective forms of energy are here used for spiritual purposes (where the energy is turned towards the Now, and therefore the Source and the essence). To teach spiritual consists after all in, among other things, in passing on energy (love, information, healing, direct transmission of spiritual consciousness). Only an enlightened master can do this. The passed on energy from the spiritual dimension is from the medium of an enlightened master (physical or non-physical) spreading itself like waves out towards those who are open, and those, who can learn and receive. In order to be able to reproduce itself in the personal images, which only work in past and future, this wavevibration-process goes through the mandala-structures of the universal images, which work in synchronism with the Now (the spiritual dimension), to the polar tension-tracks in the collective images which work in past and future. The waves have to be able to travel. The energy has to be able to spread itself from higher levels, via the teacher, and out to those who can grow in this field. The same energy, which can be used unselfish, can namely also be used turned stimulative into the Ego-structures, whereby the Ego can loose balance and expand to a super-Ego, or in another way be demonized. It is this that happens in the spiritual crisis. You have gone out in the collective time with your Ego. It is also this magic George Orwell describes in his novel 1984, with the language called NewSpeak; a language created by the rulers in order to control thinking. We all know it more or less. If you, by your surroundings, constantly are being induced some kind of image, you will in the end begin to believe in it, even if it is not true. Especially in family relations we see how family members are being induced roles which are incredible difficult to disentangle from, because family relations also have with love to do. All this is magical thinking, and there are a lot of thought distortions built into it, for example the thought distortion Arbitrary inference which means that you make a causal linking of factors which is accidental or misleading (see my book A Dictionary of Thought Distortions). The main reason for the rise of magical thinking is that you don´t discriminate between image and reality, the map and the landscape. Many gurus seem to have fallen into this temptation. In the story about the temptation in the desert we can see these possible ways of using the energy pictured in anticipated form. Here you see the possibility of using the freedom and the power to elevation of the Ego and the consequent power and material glory. But Jesus abstains from this deification of the Ego. Collective fantasies have two aspects. The one aspect of the fantasies is a kind of archetypical, mythologically symbolizings of more personally, unclarified matter (for example thought distortions - see my book A Dictionary of Thought Distortions). The second aspect of the fantasies is relatively valid information about things that lies beyond the ordinary consciousness and one´s personal history. The misguiding happens because the two aspects are blended together. The whole of the thought´s past can create a reflection of itself in the body. And if this past is filled with pain, then it can show itself as a negative energyfield in the body: the emotional painbody. It contains all the pain you have accumulated in the past. The painbody lives of that you are identified with the negative or “positive” thoughtpattern behind it, for example thought distortions. The painbody is - through the inner evaluating ego, which the painbody is constructed around - connected with the more dangerous dephts of the astral plane´s collective history, which also are a kind of dark, ancient inertia which opposes any change of the ego. The energies found here are unfathomable, and when you direct them into your painbody, you are really facing problems. That is what is happening in a spiritual crisis (read more about the painbody in my article The emotional painbody and why psychotherapy can´t heal it). The ego-religion and the ego-exercises are the ego´s incessant confirmation or denial of the ego: “it is no use with me!”; or: “Wonderful me!”. Both, either the denial or the confirmation of the ego, maintain the ego-proces, the ego-identity, and the ego-centralization. The ego´s religion and exercises are the ego´s needs and longings and will: I want to, I think, I believe, I feel, I wish, I hope, I think, I believe, I feel, I wish, or, in its most common core: I, I, I...Me, Me, Me... Therefore a spiritual crisis both can be “negative” and “positive” – the Dark night of the soul, or ego-inflation. Your ego, and your painbody, is in other words the gate where collective energies, and astral beings, can enter into your world. When you in a selfish way use the powers from the collective history of the astral plane, and which demonical astral beings will help you with (because the ego phenomenon is their magnet of attraction), you can create personal power and material glory. That is the essence of Black Magic. The ego is a demonical structure, and it attracts demonical powers and energies, which also have been created by the ego phenomenon. So, the reason why it is necessary to lead people around the collective time, or shorten the passage through it, is because that non-physical entities from these areas are using people or cults (collective energy processes in mass phenomena: religious, spiritual, political, sports or other type) as psychic channels, working interdimensionally to create all sorts of “experiences” in people; experiences that seems dazzling and/or extraordinary – but with the purpose to use their energy as food. That is: a kind of vampires, or even worse: demons. A lot of channelers are frauds, or just disillusioned because they are completely controlled by subjective feelings, emotions, intuitions; that is: identified with the painbody. But some of them are also caught up in a spiritual crisis as ego-inflation, and are actually channeling entities from the collective time. The problem is that they don´t know who it is they are channeling. Demons can be very charming, and very manipulating. They will never tell you their real names. They will tell you what you want to hear; what sounds flattering; they will give you experiences; and they will help you to gain prosperity and success. But you will eventually meet the compensatory karma, or Nemesis. So, remember: always critical examine the “teachings” channelers are channeling. Just look at the channelers within Theosophy (read my article The fascism of Theosophy and The philosophy of Krishnamurti) – we have already mentioned a few. Or take Esther and Jerry Hicks. “Abraham” is the name given by Esther Hicks to a group of of spirits (“non-physical entities”) Esther claims to channel. If you examine her channelings critical you will quickly find out that Abraham´s message is straight out of the 19th century New Thought tradition: believing makes it so. The Hickses claim Abraham gave them the “law of attraction.” If “they” did, “they” stole it from Napoleon Hill´s (1883-1970) Think and Grow Rich or William Walker Atkinson´s (1862-1932) Thought Vibration and the Law of Attraction in the Thought World (1906). You could also mention John Payne of Omni World, who channels a being he calls Omni. Here you also get a kind of “psychic copy and paste” from the New Thought tradition. Both in New Age, and in coaching, which claims to be purely neutral and scientifical, the so-called Enneagram is very popular. It is a New Age mandala, a mystical gateway to personality typing, and through this to spiritual consciousness and fuller being. The enneagram represents nine personality types. It is originally developed by Oscar Ichazo (b. 1931), who claims to have received it in a vision. Later the enneagram has turned up in several new versions, funny enough often developed by people who also claim to have received it in divine visions. So how the types are defined depends on whom you ask. The classification systems seem to have been modified according to the inventors´ own idiosyncratic beliefs. But personality typing involves several problems such as the thought distortions Representative bias, Hermeneutics of Suspicion, Prejudice, Selective thinking, Subjective validation, etc., ect. Therefore not given from a divine source (see my article Personality typing is a refined system of prejudice). The creator – or rather “The Receiver” of HDS is Alan Robert Krakower. He was born in Montreal, Canada, April 9, 1948. He lived on Ibiza under the name Ra Uru Hu, until his death in 2011. On Ibiza in 1987 he experienced an extrasensory intelligence, which he calls “The Voice.” This “Voice” gave him HDS. But again: if you examine HDS critically, you will find that it is a “psychic copy and paste” of a – within scientifically circles – very known myth about quantum physics which New Agers haven´t discovered because they keep on reading the same New Age books where the myth is repeated again and again. Besides this HDS also involves the problems of personality typing and different kinds of pseudoscience (see my articles A critique of the Human Design System and Quantum mysticism and its web of lies). 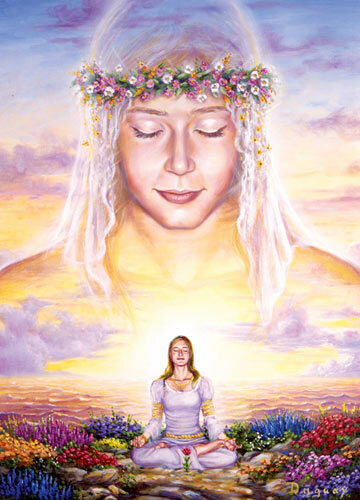 The above mentioned problems of channeling are growing and growing because New Agers have found out how easy it is to fool people with a claim of being a channeler – and as mentioned: some are directly frauds, others are disillusioned, and a few are caught in ego-inflation.